Boeing’s Chinook chosen over Russia’s Mi-26 in tender for delivery for 15-heavy lift helicopters. The Indian Air Force has chosen the Boeing Chinook over Russian Mi-26 helicopters in a tender for the delivery of 15 heavy-lift helicopters, the Indian Defence Ministry said on Wednesday. Both the Russian upgraded Mi-26T2 Halo and the Boeing Chinook CH-47F had qualified in the technical trials and their financial bids, covering the initial acquisition cost as well as the lifecycle costs. The Indian media earlier cited cost effectiveness and after-sales service as main factors that tilted the scales in favour of the US aircraft. 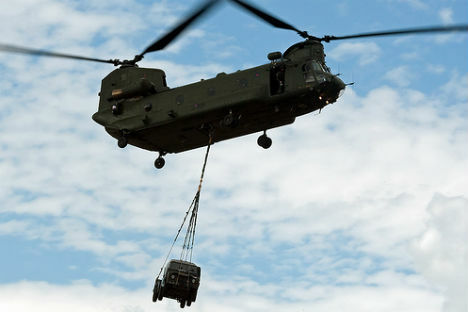 “In the proposal initiated by Indian Air Force (IAF) for procurement of 15 Heavy Lift Helicopters, Boeing with Chinook Helicopter has emerged as the L1 Vendor,” the ministry said in a statement. “The Field Evaluation Trials for these Helicopters conducted by the Indian Air Force have found them to be compliant with all the stated Air Staff Qualitative Requirements (ASQRs),” the statement said. The cost of the future contract will be determined following contract negotiations with Boeing, which are currently underway, the Indian military added. “Divulging further details in this regard may not be in the interest of national security,” the defence ministry said in the statement. Russia’s state arms exporter Rosoboronexport had recently insisted that the outcome of the tender has not yet been determined. The Russian defence company had maintained that the updated version of the MI-26 transport helicopter fully met India’s technological requirements. Russia’s traditionally strong position on the Indian arms market has been recently undermined by fierce competition with US and European companies and failures to fulfil several contracts. Last year Russian arms exporters suffered two painful losses at Indian tenders. Russia did not win the contract to supply 22 helicopters to India, which preferred the US AH-64D Apache to Russia’s Mi-28N. During the Medium Multi-Role Combat Aircraft (MMRCA) tender announced by the Indian Air Force to replace aging MiG-21s, the Russian MiG-35 did not even make it to the finals, where the Eurofighter Typhoon twin-engine multirole fighter lost a contract worth at least $10 billion to France’s Dassault Rafale. Defence cooperation between the two countries still remains strong with over a quarter of Russian military exports going to India. Around 130 Russian-made multi-purpose Sukhoi Su-30MKI fighters (which should increase to 270) and around 70 MiG-29s form the backbone of India’s fighter fleet. The hallmark of cooperation between Russia and India in the aviation sector is the joint development and manufacturing programme of fifth generation fighter aircraft (FGFA) for the Indian Air Force. In addition to modern military aircraft, Russia and India continue close cooperation in missile building, including the BrahMos supersonic cruise missile. Russia and India are working with BrahMos Aerospace to promote a family of all-purpose supersonic BrahMos land-launched and ship-launched versions of the missile based on the Russian medium-range P-800 Onyx anti-ship missile, which some experts believe is unrivalled in the global marketplace.